Here is an amazing chart that was posted at Power Line last night. 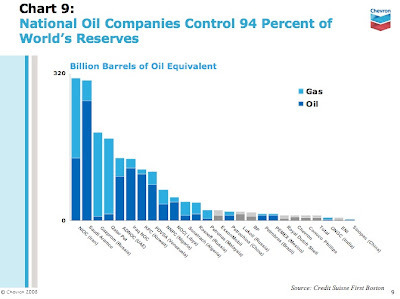 It shows that 94% of world gas and oil reserves are controlled by state owned companies. With 94% of the world’s oil supply locked up by foreign governments, most of which are hostile to the United States, the relatively puny American oil companies do not have access to enough crude oil to significantly affect the market and help bring prices down. Thus, Exxon Mobil, a small oil company, buys 90% of the crude oil that it refines for the U.S. market from the big players, i.e, mostly-hostile foreign governments. The price at the U.S. pump is rising because the price the big oil companies charge Exxon Mobil and the other small American companies for crude oil is going up. So, even if Maxine Waters and the Democrats are successful in taking over the oil companies it would not make any difference on gas prices unless Congress decides to allow American companies to explore and drill. But, Democrats want to sue OPEC.